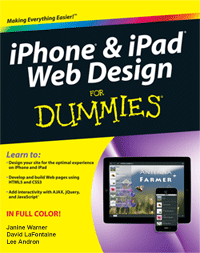 Get a password for the iPhone & iPad Web Design For Dummies Bonus Section. If you already have a password login using the form on the right sidebar to get in. What is the last word in the caption for Figure 1-2 (the second figure in Chapter 1) in iPhone & iPad Web Design For Dummies? Please enter your user name and password for the iPhone & iPad Web Design For Dummies bonus section. If you need a password, fill out the main form on this page to ask for one. If the book you have, such as Dreamweaver For Dummies, is not listed here, there are no special files required for that book. But don't feel left out, you'll find many helpful resources for Dreamweaver in the Dreamweaver Training Center, and throughout the rest of the DigitalFamily website.